8 large bunch of fresh coriander, roughly equal to 1 kg, once cut and cleaned. 4-5 raw Tamaraind fruit, peeled. 1. Remove the head, shell, tail and sand vein of the shrimp then wash in a large colander and sprinkle with two full tablespoons of salt. Shake well, letting the shrimp absorb the salt. You will need to rinse them briefly before adding them to your main pot. The trick is not to rinse all the salt off because this releases salt to the stock. Let sit for about 2 hours. 2. Soak the peeled tamarind fruits in lukewarm water at least 2 hours before. 3. Place the peeled garlic cloves in any hard and smooth type of mortar (made of iron or stone, for instance). Add turmeric and powdered chili pepper. Pound and grind the mix with the pestle until you get a dark yellow, pungent paste. 4. Cut off the long stems of coriander near the bottom of each bundle. Once you wash and dry the herb, chop them coarsely and put them aside. You will probably have a lot of trouble finding fresh fenugreek if you live in Montreal or another city in North America, so 2-3 tablespoon of dried fenugreek will work in a pinch, but you need to soak it in a small colander for a few minutes before adding it to the pot. 5. In a big pan, heat vegetable oil over medium-high heat and add the onions so that they are submerged in the hot oil. The onions (and later the herbs) will soak up all the oil already in the pot, which gives an idea of how much oil goes into this dish. Turn the heat down and settle in to monitor the process. The goal is to get a homogenous and glittering golden piaz daagh: not too dark and burned, nor too pale and raw. Note that the onions continue to brown after you remove them from the heat. SO, either take the following step immediately, or remove from the heat before they reach the perfect golden color. 6. Once the onions are glittering golden, add chopped coriander and fenugreek and fry them some more. Add the herbs at the same time only if both are fresh; otherwise, add dry fenugreek near the end of the frying process. The herbs will absorb the oil almost immediately. Do not add any oil, but keep frying the herbs until they lose their fresh green hue. 7. Before the herbs get really dark, add the garlic-chili-turmeric paste and fry for a few more minutes. The garlic component can turn bitter by over frying, so keep it brief. Stir constantly to ensure a perfectly harmonious mix. Right away, a surge of savory fragrance evaporating from the fried paste might actually knock you down! 8. Extract the tamarind’s juice by mildly squeezing it through the colander, then add the briefly rinsed shrimp and one full glass of tamarind juice and enough warm water to just top the mix. Cover and turn the heat down. 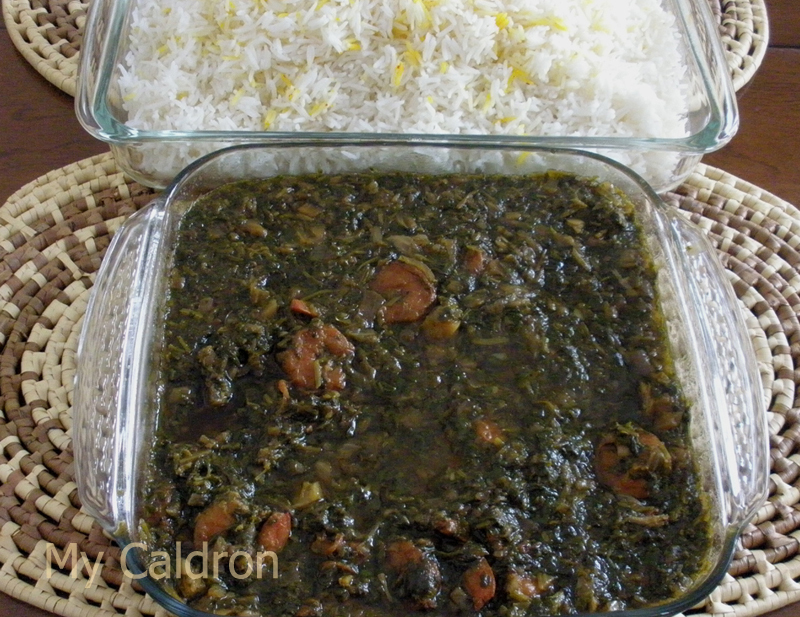 The longer you simmer the richer your ghalyeh would taste especially when you are cooking it in a large quantity. But at any rate you should simmer for a minimum of two hours before tasting for adjustment. If you need more sourness, add more tamarind’s juice, but I doubt you would need more hot spice! There are two options for thickening the stock if so required: a) peel one small potato, chop it into sugar-cube sized chunks and add it to the pot along with the shrimp and water, or b) twenty minutes before serving time, dissolve one teaspoon of flour into half a glass of the ghalyeh juice and add it back to the pot. A well-cooked ghalyeh is capable of swirling–down the hallway, out the window and off into neighborhood, making people’s mouths water, heads reel and bowels growl. 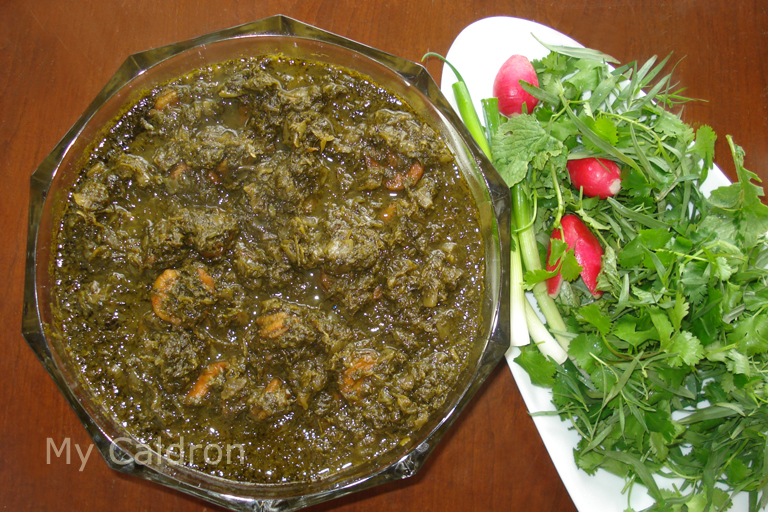 Shrimp ghalyeh is often served as lunch or dinner in small or large gatherings with plain white rice, cooked Iranian style of course, but it is sometimes indulged in with different types of Iranian flat breads, accompanied with fresh herbs (sabzi) and raw onion as well.